Your post reminded me of a visit to Sea World, where one of my favorite photos was taken. 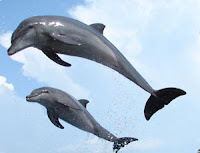 Two of our grandchildren were looking at dolphins through the sides of a clear tank, and one stopped and just stayed there looking at the two of them. Oh, to wonder what the three were all thinking of as they looked at each other so close! 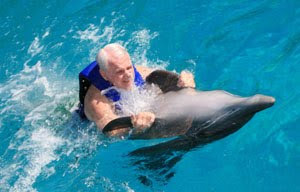 I have never wanted to swim with dolphins. Did you see the documentary The Cove? You never look at dolphins the same way after that movie. I love the photo at the top. Assuming that's you? It really expresses the joy of travel and adventure travel in particular. Yes, Alexandra, that's me. That was an especially joyful moment--what travel and a willingness to try new adventures is all about. OMG yes! I went to theme park in Orlando and I did swim with the oldest dolphin in captivity. He was amazing! What an awesome experience. I live near the beach in FL and I've watched the dolphins playing in the ocean. When I see them I know it's safe to go in the water as they will keep the sharks away. 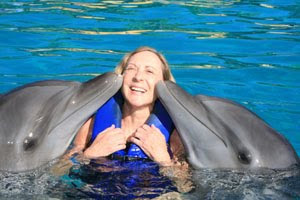 Amazing, seeing the dolphins kissing you! 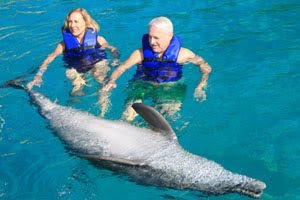 Off Cano Island Costa Rica, while snorkeling we can get very close to the dolphins-but they are not quite as tame.